Perhaps you are a newly minted business who just created their very first website. Or maybe you are a long-standing organization who has been maintaining a website for years. 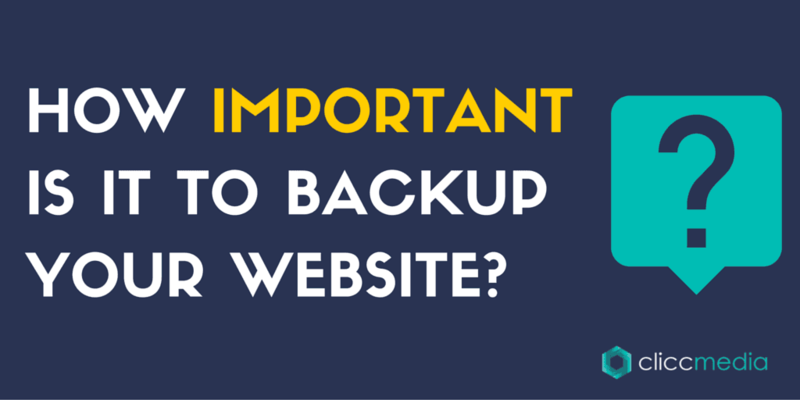 Either way, it is extremely important to remember to backup your website. The short answer is, yes. It is vital to periodically backup your website’s files and data. While you may think you are protected because you have a “foolproof” server or web hosting company, the truth is, unfortunate things happen. Including server crashes, corrupted files, or even – oops! – deleting something by accident. In order to avoid those mini-heart attacks, we offer doing monthly website backups for all of our SEO clients. That way, should anything happen, we have the most current file readily available so there won’t be any setbacks. To elaborate, keeping a current copy of your website’s data, information, and files can save you from a lot of unexpected troubles. In the event that your website gets hacked and becomes compromised, you’ll have the necessary tools required to jump back into action immediately. The same goes for server crashes, software updates, or even host changes. Regularly backing up your website can be a life-saver, and give you peace of mind. So Where and When Should I Save It? Backing up your files manually takes a bit of technical knowledge, so it may be a good idea to call in an expert. Regardless if you have a complicated site with lots of pages or a simple website, like a blog or niche site, Clicc Media Inc can provide you with expert care and assistance. Alternately, you could manually back it up on your home computer if you are familiar with basic web page functions. As far as the frequency, it is recommended that you backup your website files up monthly. Oftentimes, web hosting sites or companies offer periodic backing up. Unfortunately, it is not uncommon for them to do it much less frequent than recommended. When you take it upon yourself to perform a manual backup, you are ensuring that all of your updated information will be in an accessible place. The simplest way to store your website’s data in a secure place is using an FTP (File Transfer Protocol) program. This allows you to access the necessary files and download them to a local computer. Additionally, you will be able to remotely access them from your website’s servers so as to restore the files if necessary. There are a number of FTP clients available for you to use including FileZilla or SmartFTP. Always keep in mind that your website is your responsibility. Even if you are working directly with a web design company that offers guaranteed back-ups in a safe and fully accessible place, it is always a good idea to have a backup on a personal computer. You never know when your Webmaster will be unavailable or when the IT person in charge of the server in your office is unreachable. Don’t worry – you can thank us later! If you are interested in re-doing your website or simply want to have a second opinion done by a professional, contact Clicc Media Inc for your 1-on-1 consultation with one of our dedicated web designers. Why Am I Ranking Better On Google Than Bing?